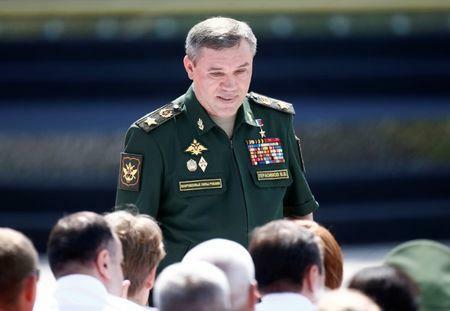 General Valery Gerasimov's allegations, made in a newspaper interview, center on a U.S. military base at Tanf, a strategic Syrian highway border crossing with Iraq in the south of the country. Russia says the U.S. base is illegal and that it and the area around it have become "a black hole" where militants operate unhindered. "They are in reality being trained there," Gerasimov said, saying there were also a large number of militants and former Islamic State fighters at Shadadi, where he said there was also a U.S. base. "They are practically Islamic State," he said. "But after they are worked with, they change their spots and take on another name. Their task is to destabilize the situation."